The Art Gallery of NSW has a new exhibition called Wilderness, and today I attended a forum where five of the contributing artists discussed their works and their art practice. None of the paintings in the exhibition are traditional landscapes; as the curator said, when putting the show together he was less interested in old-fashioned landscape painting than in artists who engage with nature and ideas of the wild. He selected images, he said, that revealed nature through the mind of the artist. My attention was particularly caught by the paintings of Mary Scott, a Tasmanian artist, whose striking monochromatic images are of stuffed hummingbirds in a case in the Natural History Museum in London. Her birds are painted larger than life, posed in flight or on perches, a strange juxtaposition of life and death. The flattened visual space and menacing shadows of her monochromatic paintings make you feel like you are in the display case with the tiny preserved birds. 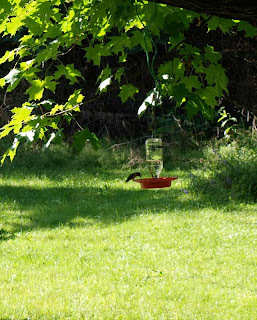 The hummingbird at left is sitting on a feeder in my sister's backyard in Colden, New York. Hummingbirds are so tiny, fragile and elusive: the idea of seeing such a lively animal frozen in time and space in a Victorian wunderkammer in a museum is a little disturbing. Mary Scott said that she felt the same when she visited the museum to photograph the taxidermied birds in their cabinet. She explained, "I am interested in how we understand, consume and classify knowledge in the modern world." Another exhibiting artist, Julie Fragar, said that painting is "a metaphor for humans trying to make sense of the world." If you are in Sydney or nearby, do try to see this exhibition. Some images in it will astonish you with their profound beauty, while others will challenge your ideas about nature and perhaps help you to make sense of the world.